Posted November 25, 2014 by Seán Kinane & filed under Homeless, Human Rights, News and Public Affairs. A woman in south Florida is in the 24th day of a hunger strike protesting the city of Fort Lauderdale’s ban on sharing food in public parks. 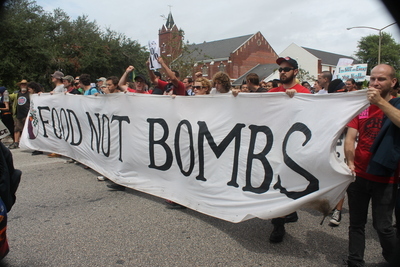 We heard briefly last week from Jillian Pim with Food Not Bombs Ft. Lauderdale, when she was about to defy the ban again. Tuesday morning WMNF interviewed her by phone about why she was on hunger strike and learned that because there are others hunger striking in solidarity she may end her strike soon because for health reasons.